April is Aussie Author Month. A time we readers get to celebrate some of the awesome creative talent Australia has produced. In children’s literature there are plenty of wonderful authors to discover, rediscover or just continue to enjoy. Below is a list of just a few people, and an example of their work, worth checking out and celebrating. This list is by no means conclusive, there are many wonderful Aussie authors not mentioned. I just encourage you to pick up an old favourite or find something new as a way to join in the celebrations of Aussie Author month. 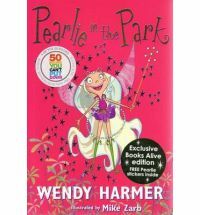 Pearlie is a park fairy, it is her job to look after Jubilee Park and it keeps her very busy. She makes sure that everything happens that is supposed to happen, she even has a list so she doesn’t forget. Then one morning she wakes up to find everything is all wrong. Pearlie needs to find out what happened and make things right again. A fun read with a format that makes it a great choice for a book to bridge the gap between picture books and first chapter books. There are enough words to be interesting, bold colourful pictures and is a size closer to chapter books. It is also one of the few that you can find in this section that has colour illustrations. Though with all the pink it will probably appeal more to girls, though there are some male and bad characters.